This property has been very well maintained and is in turn key condition throughout. It is situated in the well maintained estate of Sli gheal and No. 7 is situated to the front of the estate, fronting the main Ballymoneen road; in a small block of four apartments. There are ample parking facilities in a tarmaced driveway to the front and each apartment has their own private small garden to the rear. Constructed in the mid 2000’s, Sli Gheal is a popular residential location on the Ballymoneen road, and is conveniently located within walking distance of Knocknacarra Retail Park, Sheridan’s Bar and Restaurant, The Clybaun Hotel; NRG Gym and a host of National & Secondary schools. No 7 has been well cared for and is in excellent condition throughout. It is situated on the first floor of this small block and is accessed through a main door with tiled stairs leading to two first floor apartments. No. 7 is to the right and contains an entrance hall, two double bedrooms, 1 ensuite, main Bathroom, large living room and Kitchen/Dining area. The communal areas and the grounds surrounding the apartment are well maintained by Canley Management Co. Ltd. and the annual management fees are approximately €1,200 per annum. – Entrance Hallway: with wooden flooring and storage area to right hand side. – Living room: Situated to the front of the property and is bright and spacious room with wooden flooring and large window. – Kitchen/Diner room: Situated just off sitting room with tiled flooring. Kitchen boasts variety of walnut and cream shaker style units with tiled backsplash. – Bedroom 1: Master Bedroom situated to the rear of the property with built in wardrobes and carpet flooring. Ensuite contains white bathroom suite and is fully tiled. – Bedroom 2: Double bedroom situated to the rear of the property with built in wardrobes and carpet flooring. – Main Bathroom: Fully tiled with white bathroom suite consisting of bath, w.c. and w.h.b. This property would be an ideal purchase for the first time buyer or gilt edged investor alike. 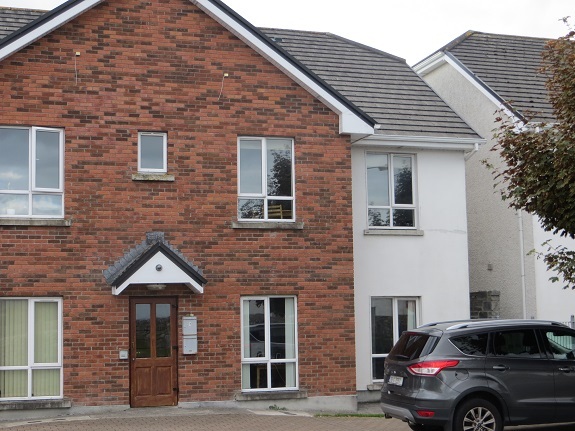 Viewing is highly recommended and for viewing times please contact Shane Cox on 087 9830450 or our offices on 091 566157. ← 7 Sli Gheal, Ballymoneen road, Knocknacarra, Galway.